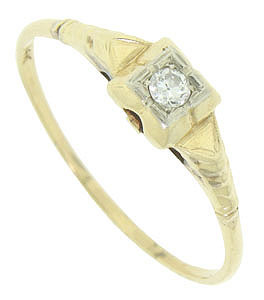 A round sparkling diamond is set in the square face of this 14K yellow gold vintage engagement ring. 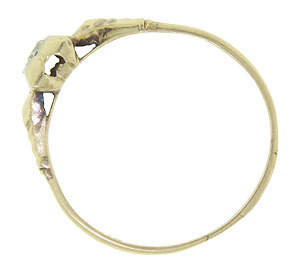 Triangular shapes on the rings shoulders point out from the central diamond and ripple down the band. This lovely wedding ring measures 5.39 mm in width. Circa: 1940. Size 10 1/4. We can re-size.